Earlier today at the SharePoint Conference 2014 in Las Vegas, Jeff Teper made some exciting announcements regarding OneDrive for Business. I wanted to share some additional details about them with you. OneDrive for Business (formerly SkyDrive Pro) is personal online storage for a company’s employees. It’s the place where people can store, sync, and share their work files across multiple devices with ease and security. With OneDrive for Business you can collaborate with others in real time right from within Office and edit documents from virtually anywhere via a web browser in real time using Office Online. Accessing your files from multiple devices is a cinch with native OneDrive for Business and Office Mobile apps (including Windows Phone, Windows 8, iOS, and Android devices). Not only is OneDrive for Business a simple and intuitive file sync and storage solution for employees, it’s a trusted service that provides enterprise-grade content management, compliance, and administrative controls, and it is financially backed by the industry-leading Office 365 Service Level Agreement. – OneDrive for Business will be available for purchase as a standalone service. It’s also still available as part of many Office 365 for business plans, but the new standalone plan makes it easy to get started using cloud storage and sharing. – It’s now easier to access, find, and manage your work files because of new user experience enhancements to OneDrive for Business. – On-premises SharePoint customers can now configure OneDrive for Business more easily—with just a few clicks—with Service Pack 1 on-premises SharePoint customers to configure OneDrive for Business with just a few clicks with Service Pack 1. Customers are already able to purchase OneDrive for Business as a part of Office 365 plans and SharePoint Online plans. Starting April 1, 2014, OneDrive for Business with Office Online will be available also as a standalone service. With the new offering, businesses of all sizes can get started with a full-featured and intuitive file sync and share service that includes Office Online, so employees can collaborate on Office documents in real time via a browser or using their Office desktop applications. The standalone offer gives businesses 25 GB of storage per employee with the option to purchase additional storage, offline sync and access from multiple devices and platforms, and a strong set of enterprise-ready administrative controls. And when you’re ready for more Office 365 services, like business-class email or online meetings, it’s easy to add them. Learn more about the standalone offering here. 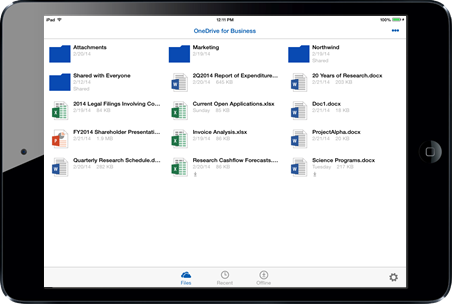 Over the past year we delivered a steady stream of new features and capabilities to OneDrive for Business, including increased file sizes, higher storage limits, mobile apps (Office Mobile for iPhone and Android, and native OneDrive for Business app for iOS), and improved user experiences like the Shared with Me view. 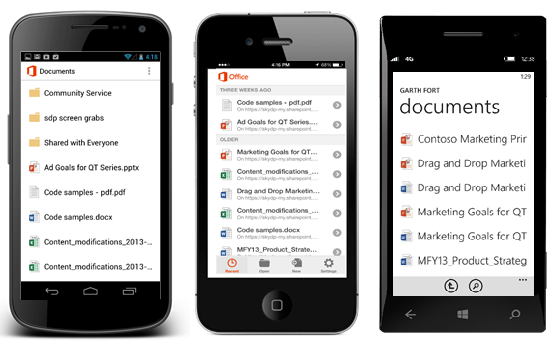 You can access OneDrive for Business on Android phones, iPhones, and Windows Phones. With this latest release, we’re making it even easier for customers to access their OneDrive for Business and to find and manage their work files. Below are some of the highlights. Simple controls. 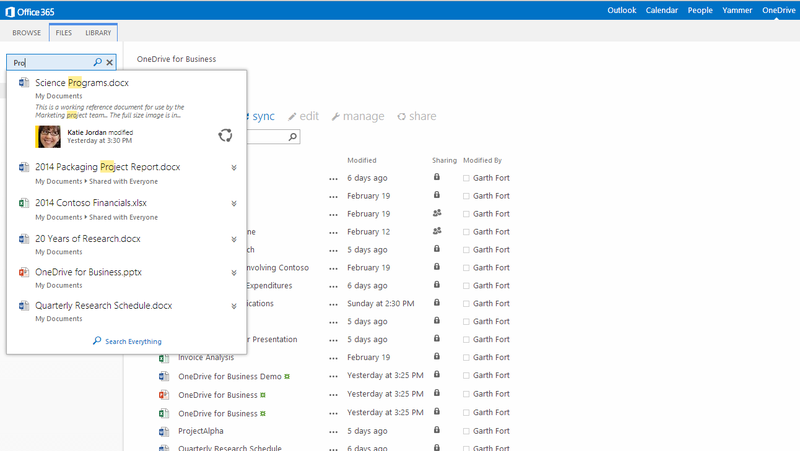 We introduced the most common tasks in OneDrive for Business as controls directly above your personal document folder. With one click, you can create new Office docs, upload files, sync your files for offline use, share your files, and more. 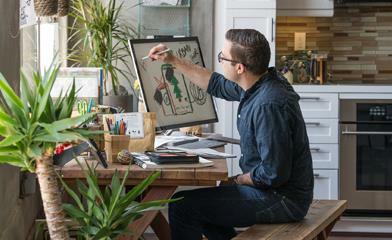 Simplified controls make it even easier to use and manage your OneDrive for Business. Site folders. We added a new Site Folders view that takes you directly to document libraries of sites you’re following. Now you can get to sites you’re following fast, right from OneDrive for Business. Search. Another improvement is the new OneDrive for Business search box. It’s smarter, with type-ahead features helping you find a document that might have been shared with you, or one that you tucked away several folders deep. You can also perform actions, like sharing these files, directly from the search results. Finding files and sharing them is even faster with the improved search box. Easier access. You can now get to your OneDrive for Business documents directly by pointing your browser to http://<tenant>.onedrive.com (for example, http://contoso.onedrive.com). Easy to remember, and easy to get to your files. We’re also making it easier for customers who have SharePoint 2013 on-premises to use OneDrive for Business in the cloud alongside their existing SharePoint deployment. With SharePoint 2013 Service Pack 1 (SP1), an IT administrator can set up OneDrive for Business using familiar IT controls. Learn more about these Service Pack 1 enhancements here. client, a native Android OneDrive for Business app, advanced auditing and reporting features, encryption at rest, data loss prevention (DLP), extensibility improvements, even higher storage limits, and more. And these are just our enhancements to OneDrive for Business! We’re also continuing to build deeper cross-Office 365 experiences, making OneDrive for Business the best file, sync, share, and collaboration solution available. – Promotional pricing: $2.50 per user per month in all licensing agreements/programs (50% discount). – For customers with Office with SA or Office 365 ProPlus: $1.50 per user per month; agreement types included: Open, Enterprise Agreement, and MPSA. OneDrive for Business is also available in (and included with) most Office 365 and SharePoint Online plans at no additional cost. We’re very excited about the above announcements and the benefits that OneDrive for Business will provide for our customers. You can learn more about OneDrive for Business here, and get started with a trial today! UPDATE: At the SharePoint Conference, we also announced that we are working on a native Mac OS sync client for OneDrive for Business with a targeted beta release later this calendar year. We also announced plans to release a native OneDrive for Business App for Android, also targeted for release later this calendar year. The blog post above has been edited to reflect these announcements.